Today again I share some small Sunnybank treasure of mine. A few years back I made a drawing of Anice Terhune and posted it on our Sunnybank facebook page. I got a few requests made to send the drawing to person who is chairman of the TSM, Terhune Sunnybank Memorial. I did so, and forgot about the drawing. 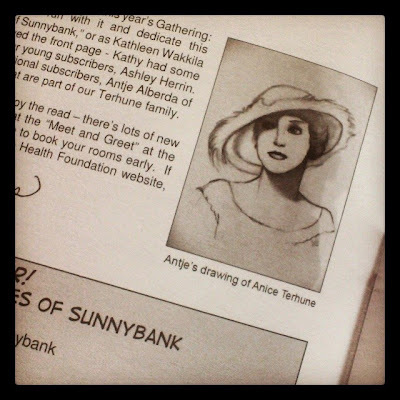 After a year, or even more, I forgot, the drawing of Anice Terhune (wife to Albert Payson Terhune, and the Mistress in the books) was even send to the TSM, and then The Lookout came, it is a small newsletter that is coming out every 6 months, with great Sunnybank news, about the place and history and such. And on the second page was my drawing. I was absolutely thrilled when I saw it. My drawing in my favorite newsletter. And then they also called the cool women who are doing awsome stuff WOW, Women of Wisteria!!! That sounded so awsome. I never thought my silly drawing skills could bring me this. I'm not sharing this because of profits or anything else, I just share this because I love Sunnybank and I really care.